Queen Elizabeth I, also known as the Virgin Queen, was England and Ireland’s monarch from the year 1558 to her death in 1603. Since then, she’s become one of England’s most iconic leaders, which certainly doesn’t mean she was loved by all. In fact, she was a very divisive and often controversial queen. That being said, there’s a lot of material to work with if anyone were to create a big budget movie about her reign. Well, lucky for us we have two. Elizabeth was first released in 1998 and it’s sequel, Elizabeth: The Golden Age, was released in 2007. Now, I’ve been wanting to watch these movies for a long time, and I’ve finally gotten around to it. The question remains, still, on wether or not they’ve lived up to the hype that I’ve built for myself. 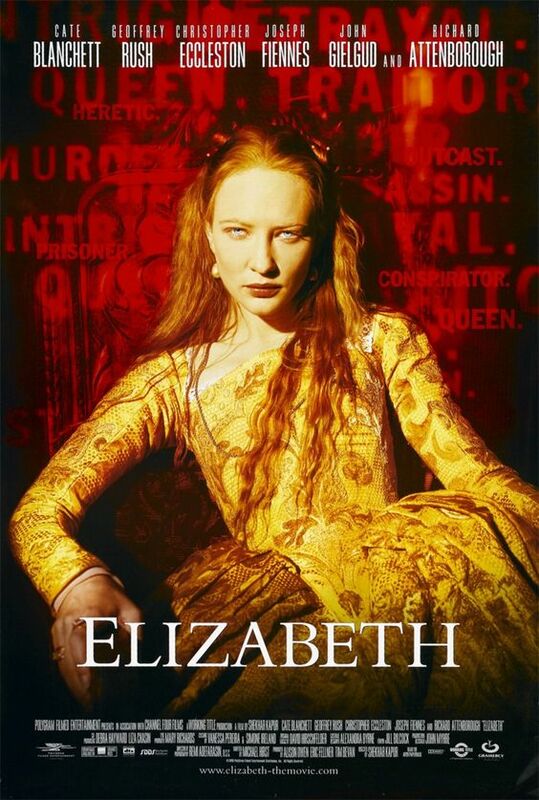 Let’s start out in 1998 with Shekhar Kapur’s Elizabeth. When Queen Mary I dies in 1558, the next in line of succession is her half sister, Elizabeth (Cate Blanchett), a young woman who is now in way over her head. At her time of coronation, England is in a terrible state. Her army is all but useless, debts plague the entire country, and there’s heated violence between Catholics and Protestants. With Elizabeth being a Protestant, there are many Catholics in her court that want her off the throne. One of these people is the influential Norfolk (Christopher Eccleston), a scheming duke with his ultimate goal of wearing the crown. With everything collapsing, Elizabeth surrounds herself with trusted advisors and defenders like William Cecil (Richard Attenborough) and the cunning Francis Walsingham (Geoffrey Rush). Even with these powerful minds surrounding her, her dedicated and unlawful affair with a member of her court, Robert Dudley (Joseph Fiennes), might prove to be her ultimate downfall. I have a weird past with this movie because I remember being young when this movie first came out and thinking it looked pretty cool. I don’t know where I saw advertisements for it, but I was always stricken by the colors, the architecture, and the costumes. Now, all these years later I’ve finally seen it and it’s pretty much exactly what I thought it would be. Elizabeth is a damn fine movie that tells an interesting, albeit fictitious, look at the early days of Queen Elizabeth’s reign before the Golden Age really began, and how the naïve girl who is crowned at the beginning of the movie turns into the rock solid monarch she is known for being. It’s a great story that’s full of political intrigue, war, corruption, and romance. That’s really all you can ask for in a movie like this, and it’s done very well. Never did I feel like I was getting cheated out of something watching this movie. It hits all of the marks splendidly. There are few elements of the movie I have to especially give more notice to. First of all, Cate Blanchett’s performance is fantastic. This was the movie that really started her career in the way that we know it today. She was acting before Elizabeth, but this is the role that got her noticed. Her arc throughout the story is an expressive one and it’s great to watch all of the changes happening to her and her reactions to them. It’s a very expressive performance that’s worthy of all the attention it receives. The costume design and make up rank up with the best of the best in film history. They are absolutely out of this world, along with the set design which honestly must have been a nightmare. Finally the collaboration of Kapur and cinematographer Remi Adefarasin makes this film truly look as beautiful as it does. After years of wondering about this movie, it’s a relief to finally see it. Elizabeth is a really good movie about an interesting and violent time in England’s past, and also about the monarch that would come to unite the country. It’s a beautiful film to look at, but also has a great story performed by great actors to back it up. It often feels Shakespearean in it’s scale, and you really can’t go wrong with that. The sequel didn’t come until nearly 10 years later, with Shekhar Kapur returning as director. This is, of course, Elizabeth: The Golden Age. While the first film began with the early days of Elizabeth’s reign in 1558, this film starts much later on in 1585. By this point, Elizabeth has established herself as a very firm and respectable leader who isn’t easy to persuade or frighten. She is surrounded by loyal subjects like the ever present Lord Walsingham and her favorite lady-in-waiting Bess Throckmorton (Abbie Cornish). When not being attended to by the people of the court, she s regaled with stories by the explorer Walter Raleigh (Clive Owen), who has plans of starting a colony in the New World. While this loyalty makes her stand tall, enemies are still lurking on all sides, with the Spanish led by King Philip II (Jordi Molla) and his Inquisition being the most relevant threat. His plan violence and schemes soon find their way into Britain with his support going to the imprisoned Mary, Queen of Scots (Samantha Morton) and an assassination attempt that may be enough to spark a war. Elizabeth: The Golden Age is definitely an impressive sequel, which is a good thing to say since it had the challenge of following up its beloved predecessor while also recreating history using a fair amount of both fact and fiction. There’s a lot of things going for this movie including the return of director Shekhar Kapur and the lead actors Cate Blanchett and Geoffrey Rush. There’s also some excellent additions like Clive Owen, Abbie Cornish, and Samantha Morton. The inclusion of foreign powers like the Spanish and the English spies that supported them also makes for really good intrigue and action to push the movie along, while there’s also the romance that you would come to expect with this kind of movie. The ingredients are all there, but it doesn’t quite reach the heights of the original Elizabeth. One thing that is missing from The Golden Age is the beautiful set design that the first film had. I understand that Elizabeth is now a completely different monarch than she was in the first film and the set is meant to reflect the personality she puts on as she leads her people, but I really miss the colors and the vastness of some of the room in the palace. There’s also nothing really new added to this movie and it feels like something of a retread in certain ways. By that I mean that I mean all of the same themes of the first film are explored, but in some different ways. I think I just wanted more from this one in the ways that the first film succeeded. Still and all, Blanchett returns with another powerful performance and the costume design are all on par with the original. 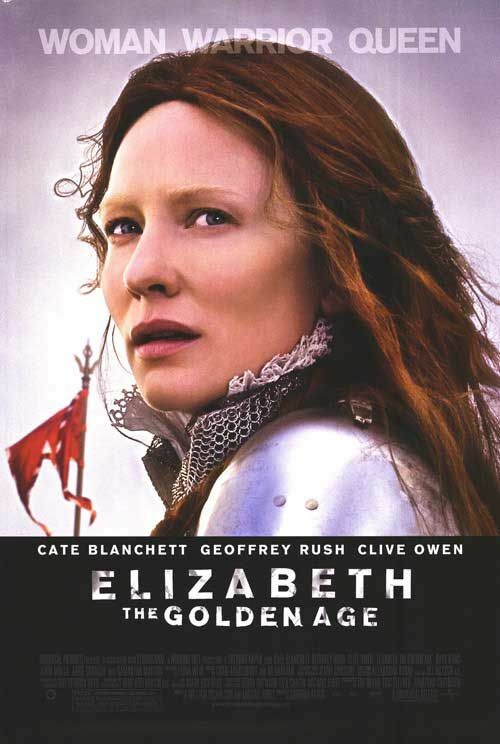 It’s important to look at sequels as movies in and of themselves and not just follow ups, so in that way Elizabeth: The Golden Age is a very good movie, but compared to Elizabeth it’s a weaker entry. That being said, I still had a good time watching this movie and for fans of the first film, it’s still worth a look. Watching movies like this are really great at pulling you into a time period and recreating history in the most lavish of ways. Anyone who hasn’t had the chance to watch the Elizabeth movies should really get right on that. They have quite a bit to offer and something in there for everyone.